English National Ballet has scored a hat trick with this triple bill, each piece a class act and finding near perfect artistic balance. The programme closes on Pina Bausch’s iconic Le Sacre du Printemps. It has to: after this searing work, there is simply nowhere else to go as the dancers, rammed through the shredder, stand quivering with every nerve ending exposed. 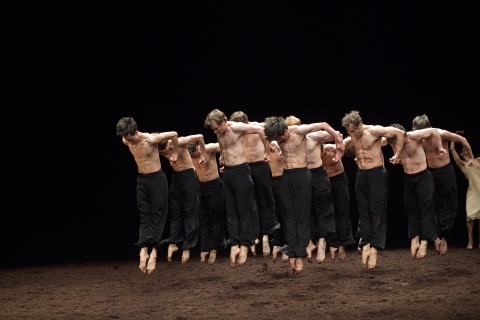 Like Igor Stravinsky’s score, Bausch’s Sacre is both timeless and for all time. The tension inherent in this lottery of death makes every action fraught, as cowed bodies stamp out the preordained ritual. The movement that comes from such an honest place, the peat floor and the scant clothing, all contrive to seal the authenticity. It demands total commitment and this it got from every member of the troupe, particularly from Francesca Velicu as the Chosen One who gave a performance so real it was painful to watch. Hans van Manen’s Adagio Hammerklavier, is classically austere in its crisp arabesques but never quite what it seems. The three duets overlap, an occasional move or glance hinting at a backstory. A ballerina is hoisted aloft but rather than swept down into a bravura fish, she is held upside down. A grand plie becomes a launch pad to throw a dancer into another’s arms. The van Manen style is distinctive, the invention endless. The tension is reflected in Jean-Paul Vroom’s ingenious backdrop, a curtain that ripples continuously. The couples seldom engage directly but even standing one behind the other, there is never a moment when they are not acutely aware of each other. This is particularly apparent in the sober simplicity of the second duet as Laurretta Summerscales and Fabien Reimair pace purposefully in unison, the stress occasionally released in a taut contraction, but the desire never fulfilled. Tamara Rojo and Isaac Hernández take these fractious relationships a step further in the final duet. The intensity of the music is mirrored in Rojo’s flexed foot as it stretches to full point bristling with unspoken conflict while Hernández tailored his exuberance to the minimalism of the male solo. The cast, completed by Fernanda Oliveira and James Forbatt in the more empathetic first duet, gave an impeccable performance heightened by the outstanding accompaniment of Olga Khoziainova, a pianist totally in harmony with the dancers. Rachel Beaujean, one of the finest interpreters of van Manen’s work, staged the work and the master himself, a spritely 84 years old, was on stage at the calls. Having proved themselves in this work, hopefully we will be seeing more of Hans van Manen’s works from ENB. William Forsythe’s In the Middle, Somewhat Elevated reflects modern life in the mix of insouciance and lethal thrust matched by Thom Willems’ strict tempo metallic punch. It has the casual stop/start nature of a rehearsal as sequences never clearly start or finish but the flashes of technical brilliance that are caught in the moment are all the more exciting for this. The dancers were simply terrific: Summerscales and Tiffany Hedman, leading the field, matched sophisticated nonchalance to fierce assault. James Streeter never ceases to amaze. Is there any role he can’t tackle? And I swear he jumps higher every season. Caesar Corrales attacked the choreography with the audacity of a rock star while Hernández, a volcano ready to erupt, was matched in the energy stakes by Crystal Costa, a miniature fireball. Precious Adams, like a streak of lightning in her jeté entrance, gave a sassy performance, proving her mastery of the style. Evenings at the theatre don’t come much better than this and ENB is to be congratulated on phenomenally good programming.